Sea buckthorn is a hardy, cold-climate plant originating from the mountains of China and Russia. This valuable plant multi-tasks as a food and medicinal source and as a barrier to prevent soil erosion in Northern climates. Its Latin name, Hippophae rhamnoides, means “making horses bright,” a reference to the food of horses belonging to Genghis Khan’s troops. It produces berries that last through winter, providing vitamin C, E, folate, carotenoids, flavonoids and fatty acids. The seed’s oil is rich in fatty acids and vitamin E, K, carotenoids and sterols, a substance that aids in cell function. 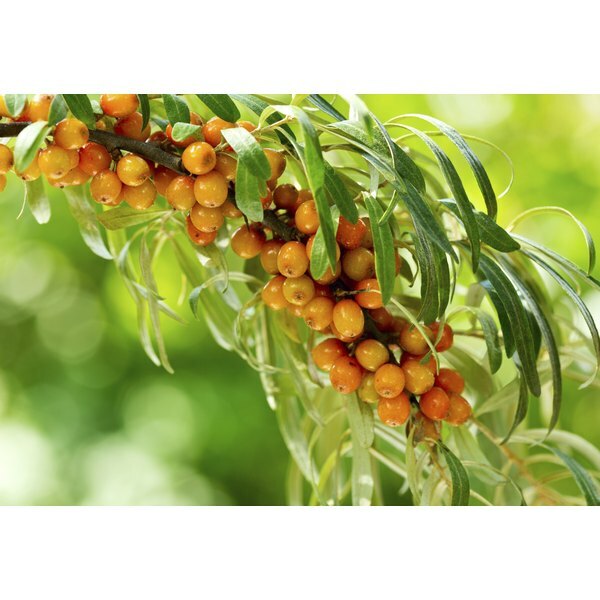 Uses of the sea buckthorn include cancer treatment, cardiovascular health and wound treatment. Talk to a doctor before taking sea buckthorn for any medicinal purpose. Based on promising radio-protective effects of sea buckthorn berry extract in rats, scientists conducted a study published in November 2009 in the “Indian Journal of Medical Research” that evaluated the chemical effect on human cancer cells. The extract, referred to as RH-3, was applied to cells in the early and late process of radiation. The antioxidant effect of RH-3 reduced the damage to cells both inside and out most effectively at certain doses. RH-3 also activated proteins in the cells that help to protect them from radiation. More research is needed. The Chinese use sea buckthorn in herbal medicine to treat heart problems. Researchers evaluated the effects of sea buckthorn on rats that were prone to stroke. This study, published in the June 2008 issue of “Clinical Hemorheology and Microcirculation,” involved treating the rats with the powder made from the dried berries of buckthorn for two months. The rats that received the powder had decreases in blood pressure, heart rate, plasma cholesterol and triglycerides, while also reducing stress on the small blood vessels within the heart. In a May 2008 study published in China, researchers discovered that the flavones of sea buckthorn may prevent the restriction of blood flow to the heart by regulating proteins within the body. One component of the sea buckthorn’s oil, palmitoleic acid, is also present in human skin, which explains why it is used for burns, wound healing, infections and skin diseases. This oil also has UV-blocking properties, aids in skin regeneration and promotes shiny, healthy hair -- just as it did for Khan’s horses. In a June 2006 study published in China, researchers investigated the therapeutic effects of the oil on burn patients by applying the oil to the dressing. This treatment was given to 151 burn patients who experienced reduced swelling and pain as well as faster skin regrowth than the group receiving only petroleum jelly treatment. According to Drugs.com, doses of sea buckthorn include 5 g to 45 g of oil daily or 330 ml per day of berry juice. It is recommended that women who are pregnant avoid sea buckthorn as the effects are unknown. Sea buckthorn can interact with cyclophosphamide, used for treating some cancer and autoimmune diseases, and farmorubicin, a type of antibiotic. Cisplatin, a chemotherapy treatment, may also be affected by the use of sea buckthorn. Adverse reactions and side effects are unknown.